Compassion is better known as resilience training. It is an integrative and quite complex mind and body state that prepares us to lean into our own or other’s suffering with a profound desire to alleviate that suffering. This requires a deep ability to hold on to ourselves so we don’t get swept away in the current of suffering. Our care taking of others often leaves us feeling depleted both emotionally and physically. This is in large part, because we have taken our selves out of the equation. This is an epidemic with healthcare professionals and is known as “compassion fatigue.” When we train in resilience we are equipped to handle suffering, because we have practiced holding on to ourselves. This is not easy to do when the rubber meets the road in our life. Learning how to resource our selves from an endless reservoir of compassion, is the key to our well-being, happiness, joy, wisdom, and inner peace. CBCT® (Cognitively-Based Compassion Training) is a method for cultivating greater well-being through the use of reflective practices. Out of a response from a campus suidide and an increase in mental health issues seen in students, CBCT® was developed at Emory University in 2004 by Geshe Lobsang Tenzin Negi, Ph.D. CBCT® is based on centuries-old techniques from the Indo-Tibetan tradition. Dr. Negi collaborated with the Dalai Lama and drew from the lojong tradition, a set of meditative practices designed to bring about ‘thought transformation,’ to create this contemporary and secular method. CBCT is independent from—and in many ways supportive of—any faith or belief system. It is now being researched and taught internationally. Analytical mental exercises are used to progressively foster compassion through a process that begins with the stabilization of attention and awareness of mental activity. With increased calmness of mind, the practitioner can cultivate a greater sense of closeness and connectedness with others, strengthening compassionate concern while avoiding related distress from empathic fatigue. CBCT® offers tools to expand compassion toward wider and wider circles. The practices support the growth of a number of mental states and behaviors valued across cultures, such as kindness, gratitude, generosity, and warm-heartedness. The fundamental premise is that compassion is a trait that can be developed and expanded. This view is supported by contemporary science as well as by most spiritual traditions.Dr. Managing stress both personally and professionally when you are in a healthcare profession can be the difference between thriving and just surviving. Training in compassion meditation practices aims to reduce the negative implications of prolonged stress and reduce the risk of burnout and staff turnover. It seeks to increase emotional, physical, and overall satisfaction for both staff and patients. CBCT® supports healthcare workers taking care of themselves using analytical mediation as part of an interactive process supporting compassionate care and leadership. Anecdotally, MHP’s describe the extreme and persistent nature of stress in their work environments. Often colleagues describe stress and burn-out as being tired, not being able to think clearly, and feeling overwhelmed. CBCT® fosters a road map to well-being that helps buffer you from burn-out through engaged compassion that may positively impact the quality of patient care. This program equips you with the skills for better emotional management in addition to cognitive action strategies that promote pro-social flourishing. When we learn to compassionately take care of ourselves, we learn to compassionately take care of others. 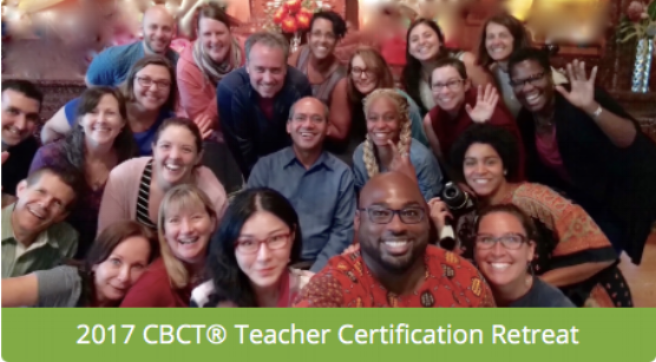 CBCT® is a toolbox of research-based, analytical meditation practices that help to nurture inner thoughts and emotions, and maintain self-control, helping one properly manage personal and occupational stress, overwhelm and prevent burn-out. To schedule or see upcoming workshops of CBCT® for MHP’s click here. Every once in a great while, if we are lucky, we come across a great teacher in our lives. One that calms the hubris of your mind, settling the overwhelming ramshackle of your fickle and capricious thoughts. Good teachers open doors, and may perhaps change, (or is it course correct) your life trajectory all together. And with the certainty of their knowledge and by dint of their patience, they see something in you and help you see it as well. This is Dr. Negi for me and my life intersected with his in 2017 when I was first introduced to CBCT®. This is a program for everyone. Compassion does not discriminate upon the basis of religion, social status, skin color, educational level or profession. Dr. Negi drew upon a lineage of meditation techniques and conscientiously secularized them so that they are pragmatic and to be used in our everyday lives. This is a structured course that aims to help foster a sense of well-being, thriving and flourishing in the way that we are supposed to be in this world. It is training in an active and engaged compassion with a clear, calm and stable mind. Many times we believe we are acting out of compassion, but our constant giving leaves us feeling exhausted, overwhelmed, even enraged what has come to be known as “empathic fatigue.” That is compassion without wisdom. Compassion with wisdom can be discovered through this analytical meditation process, during which you can access an endless reservoir of compassion that can reduce stress, overwhelming feelings and burn-out. To schedule or see upcoming workshops of CBCT® for everyone in the community click here.